.Boston Lat., Lon. (42.35892° N, -71.05781° W) . Welcome to my blog about Haiti, Haitian Outreach, and our involvement with the sisters we support, The Daughters of Mary Queen Immaculate of Haiti. Building Haiti - a beautifully illustrated research paper by talented NYC based artist Caroline Caldwell @dirt_worship with insights on Haiti's past with a look toward the future. Building Haiti , a Sarah Lawrence College conference project by Caroline Caldwell, is an illustrated piece which focuses on Haiti's historical legacy of being colonized and the neocolonial aspects of international aid given to Haiti after the 2010 earthquake. January means it's time to get ready to visit our sponsored students in Haiti soon. We are sooo looking forward to seeing them all! All Rice Money must reach Pauline no later than February 14th to ensure it is ready to hand to the student in March when we visit. Sometimes near us the Rara bands play in the street late into the night. Typically there would be a round of practice followed by the main event. I always look forward to these nights. This year it occurred on a Saturday night. One could first notice it by hearing a horn playing off in the distance and then approach closer and then pass by in a parade like fasion. An informative interview which sums up what Haitian Outreach is about and offers personal insights to our visits there. Claire (Babineau) Giuliani, of Fitchburg was the eldest child of Raymond Rita (Sauve) Babineau of Fitchburg and was a 1958 graduate of St. Bernard's High School. Shortly after graduation, she began working for Stop and Shop and was a coach for the award winning St. Joseph's CYC Cheerleading squad. During the 70's she served on the Council on Aging and worked on several political campaigns as a Democratic activist, representing Fitchburg as a delegate to the Democratic Party state convention several times. Claire was active as a Eucharistic Minister at several local Catholic churches. With her husband Louis, she co-directed the Madonna of the Holy Rosary annual Garlic Festival for many years. She was a dedicated member of the Serra Club and Sons of Italy. She also volunteered her time for her son's activities as a Den Mother and adult leader of Cub Scout Pack 17 and concession manager of Babe Ruth baseball. After retirement from Stop and Shop after 44 years of service, she worked as a secretary for a laboratory supply company in Hubbardston and at Independent Cleaners. She enjoyed sewing, knitting and crocheting. Most recently, Claire was deeply affiliated with Haitian Outreach for 15 years with a long tenure as the Director of Child Sponsorship. She traveled to Haiti frequently, delivering supplies critical to Haitian student education and general well-being. She was extremely generous and deeply touched many people's lives. Her greatest joy was her family. She was very happily married to Louis Giuliani for 41 years. Together, they traveled extensively through Canada, Italy, Greece, the Caribbean; she especially enjoyed trips to Marco Island in Florida and to California to visit her brother Bob (Bonnie) Babineau. She was very proud of her daughter Lisa Poirier (Jes Fowler), son David (Annette) Giuliani, daughter Cheryl Vaillancourt, sons Louis (Karyn), Paul (Joan) and Charlie Giuliani. She doted on her grandchildren, Nichole and Renee Vaillancourt, Jenna and Janelle Giuliani, Danny and Emily Giuliani, John and Noah and the late little Louie Giuliani, Andrew and great grandchild Jack Giuliani. A wake will be held on Friday, November 1st from 4:00 to 7:00 PM in the Brandon Funeral Home, 305 Wanoosnoc Rd., Fitchburg. A Funeral Mass will be held in St. Camillus Church on Saturday, November 2nd at 10:00 AM. In lieu of flowers, the family requests donations to Haitian Outreach, 144 Chester St., Fitchburg, MA 01420. This note is to let you know that there will be a large yard sale to benefit Haitian Outreach on Saturday June 1st from 8am to 4pm at Alpha Real Estate on Lunenburg St. in Fitchburg, MA. Plenty of parking and anyone is welcome to volunteer to help. Slate: Humanitarian Malfeasance - The United Nations is responsible for killing more than 8,000 Haitians since 2010. And it's not even willing to say it's sorry. There will be a bucket at each entrance of the church during the month of January for donations. We will be traveling to Haiti on March 5, 2013 with 10 travelers including Deacon John and Sandra Carney and Louis & Claire Giuliani of this Parish. Check out this wonderful short video which showcases PeaceQuilts' partnership with BrandAid. August is approaching very quickly. Our first shipment of backpacks is being shipped July 20. Have you started making yours? Please let me know if you need help. We have made 160 of them so far and we can help you. Send $60.00 to Claire Guiliani, 144 Chester Street, Fitchburg, MA 01420 and we will make one for your child. Call me if you have questions 978-424-7351. "In Haiti's Hands" - A dream-like portrait of the poor in Haiti focuses on a group of nuns as they struggle to lift their people up. Directed by Jeremy Mayhew. Hello, I hope you have had a wonderful Easter and a healthy spring. Louis and I have returned from Haiti and it was a great trip except for the 4.6 earthquake we had. The people are still so scared of having another big one. Haiti is progressing after the quake of 2010 thanks to the Clinton Bush Foundation. The new president of Haiti is working with them and a lot is being done, finally big trucks, equipment to haul the debris, solar street lights, work at $2.00 American dollars a day for people to carry debris and load trucks for 9 hours a day. Gas there is $7.00 dollars a gallon. All of our property is rebuilt and our six schools repaired. We now have 417 sponsored kids in school and I brought 40 new photos of kids that need sponsors. School in Haiti is not free, no public school system, so a child that goes to school is very lucky. If you know of anyone who would like to sponsor one of our kids let me know. Tuition is $125.00 a year for school (uniform, shots, and a bowl of rice each day). Also $60.00 for a backpack filled with necessities for a total of $185.00 due by August. Please pray for a safe trip to Haiti and we will have updated files for you when we return. Hello sponsor of one of our Haitian children. I hope your summer is going well. Have you started making your child's backpack yet? So far we have made about 80 of them. We will be sending out our first shipment at the end of July. If you wish us to make your child's backpack please send $60 to Claire Giuliani, 144 Chester St., Fitchburg, MA 01420 as soon as you can and we will be happy to make it for you. Tuition will be due before September 1st ($125) so your child can happily start a new year of school. Thank you so much for all that you do for the poor of Haiti. Have a great rest of the summer. March 2011 Update - Update from Louis & Claire Giuliani about recent March 2011 Haitian Outreach trip. HAITI 2011 - Pictures from our March 2011 Haitian Outreach trip. 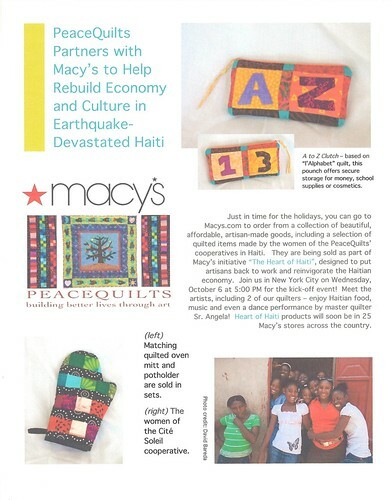 Just in time for the holidays, you can go to Macy's.com to order from a collection of beautiful, affordable, artisan-made goods, including a selection of quilted items made by the women of the PeaceQuilts' cooperatives in Haiti. They are being sold as part of Macy's initiative "The Heart of Haiti", designed to put artisans back to work and reinvigorate the Haitian economy. Join us in New York City on Wednesday, October 6 at 5:00 PM for the kick-off event! Meet the artists, including 2 of our quilters - enjoy Haitian food, music and even a dance performance by master quilter Sr. Angela! Heart of Haiti products will soon be in 25 Macy's stores across the country. You can also go online to the PeaceQuilts store at www.haitipeacequilts.org to buy our one-of-a-kind art quilts. PICTURES FROM HAITI - latest pictures include March 2010 Haitian Outreach trip from Claire. PICTURES FROM HAITI - latest pictures include March 2010 Haitian Outreach trip from Gloria. March 2010 Update - Update from Louis & Claire Giuliani about recent March 2010 Haitian Outreach trip. Greeting: Sak pase? - What's happening? Pictures from Haiti - photos by Axelle from recent March 2010 Haitian Outreach trip. FRONTLINE: The Quake - A powerful report on Haiti's tragedy, with never-before-seen footage of the moments after the quake. What can be done now -- and who will do it? Thursday, March 25, 2010 5:33 p.m.
Hi to all, We are in Haiti, and it is much worse than we could imagine it would be. We are staying at the fish farm (Lilavois). It is very hot hot hot!!!!!!!!!!!!!!!!!!!!!!! but we will survive so don't worry. Date: Monday, March 15, 2010 at 8 p.m.
Tuesday, March 2, 2010 11:33 p.m. Here is the latest batch of photos from Wesner in Port-au-Prince. I would like you to know that we are going to Haiti on March 19, 2010 for two weeks to visit your child. 12 of us will be traveling and if you wish I would be happy to hand carry any monetary gift, photo, or letter to your child. Sunday, February 14, 2010 4:01 p.m.
Wednesday, February 10, 2010 8:17 a.m.
Wesner is sending more photos from Port-au-Prince. The latest photos show some of the everyday routine. They show how many live in tent cities or make-shift shacks and the long lines for food and water. Tuesday, February 9, 2010 6:36 p.m.
Country music group Maverick Street Band is planning a benefit concert for Haiti at the Montachusett Regional Vocational Technical School in Fitchburg, MA. Concert tickets are $20 each. All the proceeds are going to support Haiti through Mission E4 and Forward in Health. Monday, February 8, 2010 6:20 p.m.
On Friday, February 12, 2010, at 7 p.m. Harvard College students have planned a benefit concert to raise relief funds for Haiti. The concert will be held in Sanders Theatre and simulcast on the web. All proceeds from ticket sales to support Partners in Health aid work in Haiti. Tuesday, February 2, 2010 8:35 p.m.
February 2010 Update - A note from Norman Charpentier, Director of Haitian Outreach. Saturday, January 30, 2010 4:35 p.m.
Wesner sent more photos from Port-au-Prince. Friday, January 28, 2010 6:54 p.m. Forward - Winddcheley is a good friend of mine. Up until the earthquake he was studying diplomacy in his third year at university. Both his home and university now lay in rubble and he now asks the question that many others are asking—Now what? I catch him online and ask about the conditions and how he is doing. Greg: So where are you living now? Winddcheley:I don't have a specific place. Last night I slept in Petion-ville, this morning I was at St. Marie, now I don't know where I should go. Greg: Are you able to get food and water? Winddcheley: so now, you need 5 Haitian dollars (previous price was 3) to buy a bottle of water. Imagine that life here in Haiti Greg. Afterward - In Haiti the situation was dire to begin with long before the earthquake. This disaster has only amplified the everyday struggle for the very basics to sustain and live. Tonight I send him money through Western Union. Thursday, January 28, 2010 8:54 p.m.
Thursday, January 28 5:24 p.m. It is hard to put into words. Parfois la vie est tres dificile only begins to describe life there. Monday, January 25, 2010 7:21 a.m.
What is Haitian Outreach? To me it is an oasis of good in a land of struggle and despair. I am currently writing more about who Haitian Outreach is and what Haitian Outreach does. Look back here for more on what I write. I found this document, Haitian Outreach Goals, which helps explain what was accomplished through the years. It needs to be updated to cover up until now but it's a good start. Friday, January 22, 2010 1:18 p.m.
Wesner sent more photos from in and around the Port-au-Prince area. Thursday, January 21, 2010 2:14 p.m.
Wesner sent photos taken from St. Marie in Canapé Vert. This is the location where we stay when we visit. Thursday, January 21, 2010 10:14 p.m. The other day in Chicago I had some time before heading off to the airport to return home from a business trip. I went to Starbucks to get a coffee and catch up on some phone calls and emails. I called Karen to find out the latest details she knew about our group in Haiti. She told me some good news about a friend traveling there to visit our loved ones in Port-au-Prince. He was to travel there by way of flying to the Dominican Republic first and then to travel the rest by road. While I was talking on the phone there was a woman sitting next to me reading about the latest news about Haiti on her iPhone. After my call ended she asked me about Port-au-Prince and my connection to Haiti. After telling her about the wonderful things Haitian Outreach does she offered me a check on the spot. One of the great benefits to helping with Haitian Outreach is the wonderful and caring people you meet with generous hearts. Thursday, January 21, 2010 12:44 p.m.
Monday, January 18, 2010 6:26 p.m.
Good news Yeye is alive, Patrick is alive, and the Ismael family. Monday, January 18, 2010 3:41 p.m.
Saturday, January 16, 2010 5:39 p.m. In Haiti, the phrase "Life there is difficult" is an understatement. I was able to chat with Winddcheley over the internet this afternoon. I was able to get a sense of the state of mind there and the outlook is one of despair. It is a nightmare. Everything is gone... housing, universities, stores, businesses all gone. And that is just the material structures. Life now consists of survival outside with little food, unclean water, and the smell of death hangs in the air. Life before the earthquake was already difficult. Before the earthquake, there were stories of death without dignity. Horrific and unimaginable stories—Babies which don't have proper burial are fed on by pigs.. Another story of having to move your loved one from one morgue to another to avoid rats consuming the corpse.. It then goes from bad to worse. Post-earthquake, bodies line the streets of Port au Prince and dogs are eating the decomposing bodies. The phrase "Life there is difficult" doesn't even begin to describe it. All we can do is to help them get through these times with whatever support we can give... for all of us to come together and empower them to rebuild their lives again. Saturday, January 16, 2010 2:31 p.m.
Of the approximate 40 young women living at Ste. Marie, 15 are unaccounted for. They are believed to have died in the ruble of the collapsed building. Friday, January 15, 2010 5:54 p.m.
Just received word from Karen that Drack and Wesner are alive and well. What a big relief! Friday, January 15, 2010 5:33 p.m.
After sending emails and voicemails today, I still haven't heard from anyone in our group. I am not sure if that is a good or bad thing. Thursday, January 14, 2010 11:13 p.m.
5 of the 15 girls under the rubble at Ste Marie have been rescued alive. Thursday, January 14, 2010 9:17 p.m.
All the buildings at Ste Marie have collapsed or are too precarious to live in. The Sisters are sleeping in a tent in the courtyard. No other new injuries have been added to the list. Thursday, January 14, 2010 6:25 p.m.
For St. Marie we have heard from Sr. Cadet's brother. The good news: Sr. Gibbs, Sr. Marlene & Sr. Cadet are all well. The bad news: 3 sisters are believed dead under the rubble of a building at St. Marie (we do not know their names) and 15 of the children. The school in Lalue collapsed. No news of the sisters there. Good news: Lilavois is intact. Thursday, January 14, 2010 4:29 p.m.
As of today, Thursday, we have heard very little from Haiti. On a normal day, the communications and electricity in Haiti are spotty and intermittent. We are still waiting to hear from our Sisters at St. Marie. We hope to hear from them soon. We have received some good news from our man Winddcheley. He has lost everything but he is alive in Fond de Blanc on the outskirts of Port-au-Prince. Thursday, January 14, 2010 3:44 p.m.
From looking at satellite images of the buildings at Lalue, Croix des Bouquet, and Lilavois, they all appear to be intact. I am concerned with the St. Marie location. Most notably with the largest of the buildings which houses the kitchen, girls' bunk beds, Nuns' sleeping quarters, and chapel. The image shows shadows where there shouldn't be any. I am hoping and praying for their safety. Dalmatian puppies for sale - looking for a few good homes for a new litter of dalmatian puppies in MA. This graphic shows the three worlds as separated during the Cold War era. The First World countries were those aligned with either capitalism or NATO, the Second World countries were those aligned with communism and the Soviet Union, and Third World countries were those that were non-aligned or neutral in terms of the cold war. Just who is on the bottle of Samuel Adams beer? Paul Revere as depicted in a circa 1772 portrait by John Singleton Copley. Samuel Adams beer label also shows the American linen; silver teapot is replaced by mug of beer. Samuel Adams as depicted in a circa 1772 portrait by John Singleton Copley. Photo of kindergarten wall in Port-au-Prince, Haiti. Twenty years from now you will be more disappointed by the things that you didn't do than by the ones you did do. So throw off the bowlines. Sail away from safe harbor. Catch the trade winds in your sails. Explore. Dream. Discover. I have learned that the only time that one man can look down upon another is while he is helping him up. If we are to grasp the reality of life while we have it, we will need to wake up to our moments. Otherwise, whole days, even a whole life, could slip past unnoticed. The probability that we may fail in the struggle ought not deter us from the support of a cause we believe to be just. ... I was faced with a choice. To deny my addiction and embrace that 'comfortably num' but 'magic-less' existence or accept the burden of insight. Take the road less traveled and embark on the often painful journey to discover who I was and where I fit. You may be 38 years old, as I happen to be. And one day, some great opportunity stands before you and calls upon you to stand up for some great principle, some great issue, some great cause. And you refuse to do it because you are afraid... Well you may go on and live until you are 90, but you're just as dead at 38 as you would be at 90. And the cessation of breathing in your life is but the belated announcement of an earlier death of the spirit. You died when you refused to stand up for right. You died when you refused to stand up for truth. You refused to stand up for justice.